proteinuria. For excellent patient education resources, visit eMedicine's Immune System Center and Sexually Transmitted Diseases Center. Also, see eMedicine's patient education articles HIV/AIDS and Rapid Oral HIV Test. accounts for approximately 1% of new ESRD cases in the United States. female ratio of 10:1. The mean age of persons with HIVAN is 33 years. 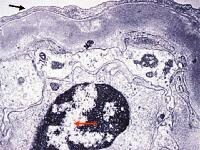 HIV-1 in the kidney and for the existence of a renal viral reservoir. expression in HIV-1 – infected monocytes. Viral replication in response to cytokines may play an important role in the pathogenesis of HIVAN. scan on 190 African American individuals with FSGS and 222 controls. 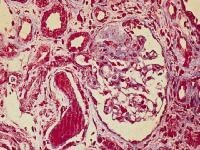 They identified a chromosome 22 region centered on MYH9, a functional candidate gene expressed in kidney podocytes. They concluded that genetic variation at the MYH9 locus substantially explains the increased burden of FSGS and hypertensive kidney disease among African Americans. inclusions (red arrow) are present. 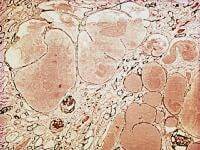 leukocytes, hyaline casts, and oval fat bodies, but no cellular casts. targets the CCR5 protein and stops the virus from entering cells. electrolyte abnormalities (see the image below). virus (HIV). ARF stands for acute renal failure. patient's daily protein excretion is greater than 1 gram. recommendations for dosage adjustments for renal insufficiency. died from complications, and 7 were alive and no longer had ESRD. effective in reducing the proteinuria observed in persons with HIVAN. The usefulness of cyclosporine therapy for HIVAN warrants further study. and a reduction in the level of circulating inflammatory cytokines. 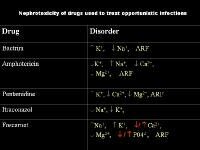 comparable to that in HIV-negative patients can be achieved.